Today, I’m thrilled to have Ed Hallen on the show. If you’ve never heard of Ed, he is the founder and CEO of Klaviyo, a very popular email marketing provider that specifically caters to ecommerce stores. Email has been a very central part of my marketing strategy for both my blog and my ecommerce store. And just recently, I’ve been cheating on my other email provider with Klaviyo and I’m thinking about getting a divorce. I’ve been very impressed with what I’ve seen so far even though I’ve really just scratched the surface and what’s so powerful about Klaviyo is that it allows you collect information about every single customer in your shop and what they purchase. Intro: You are listening to the My Wife Quit her Job Podcast. And if you are new here, it’s a show where I bring in successful bootstrapped business owners to teach us what strategies are working and what strategies are not. Now I don’t bring on these famous entrepreneurs simply to celebrate their success. Instead I have them take us back to the very beginning and delve deeply into the exact strategies they used early on to gain traction for their businesses. Now if you enjoy this podcast please leave me a review on iTunes and join me for a free live workshop on ecommerce which I give on a regular basis. For more information about the workshop, go to mywifequitherjob.com/workshop. And if you want to get a jump on starting your own online business, be sure to sign up for my free six-day mini course, where I show you how my wife and I managed to make over 100k in profit in our first year of business. Go to www.mywifequiteherjob.com and sign up right on the front page. Now before I begin I just want to give a quick shout out to HostGator for sponsoring the show. HostGator is an incredible webhost that I highly recommend, and in fact did you know that mywifequitherjob.com was hosted in the HostGator in the very beginning? They offer 24/7 live support via chart, phone and email, one click WordPress install, so you can literally install an entire blog in just one click. And easy to use website builder design services, marketing services, and the best part is that I’m offering a 30% discount for all podcast listeners. Please go to HostGator.com/mywifequit to redeem the 30% discount. Once again that’s HostGator.com/mywifequit. Now I just want to give another shout out to my other episode’s sponsor Bigcommerce. Now Bigcommerce is a fully hosted shopping cart platform that allows you to set up your own online store in minutes. And as most of you probably know, I teach a class on how to start a profitable online store. And Bigcommerce is actually one of the shopping carts that I highly recommend in my class. Now here’s what I like about Bigcommerce. Unlike other competing platforms, Bigcommerce does not nickel and dime you with every little shopping cart feature. And when you sign up, you immediately have a fully featured and extremely powerful shopping cart at your disposal. There’s also an incredible theme store where you can choose from a variety of attractive store designs so you don’t really need to hire a designer. Everything from design to payment processing is all built-in, and all you got to do is populate it with your own products, and you can literally start your online store in a matter of hours. Simply go to bigcommerce.com/mywifequitherjob sign up and you will instantly receive one month free. Once again the URL is bigcommerce.com/mywifequitherjob, now onto the show. Welcome to the My Wife Quite Her Job Podcast. We will teach you how to create a business that suits your lifestyle, so you can spend more time with your family and focus on doing the things that you love. Here is your host Steve Chou. Steve: Welcome to the My Wife Quit Her Job podcast, today I’m thrilled to have Ed Hallen on the show. 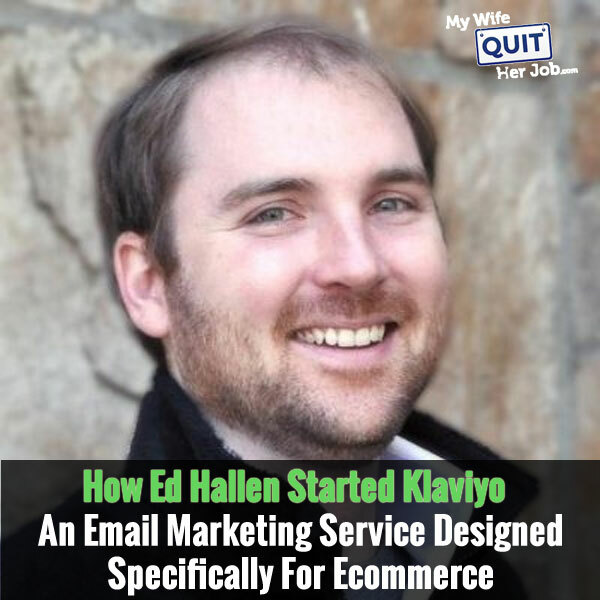 Now if you’ve never heard of Ed he is the founder of klaviyo a very popular email marketing provider that specifically caters to ecommerce stores. Now email has been very a central part of my marketing strategy for both my blog and my ecommerce store. And just recently I have been cheating actually on my other email provider with klaviyo, and I’m thinking about getting a divorce actually. I have been very impressed with what I have seen so far, even though I really just scratch the surface of the email marketing service. And what’s so powerful about Klaviyo is that it allows you to collect information about every single customer in your shop and what they purchase. So therefore if you want to send an email for anyone who has purchased a red lace handkerchief, you can easily do that. If you want to send an email to people who haven’t purchased in 60 days you can easily do that. If you want to offer a onetime coupon to first time buyers only you can easily do that. So Klaviyo is the most powerful email platform that I have actually used for ecommerce that’s far, and with that welcome to the show Ed, I’m really eager to see and learn how Klaviyo got started. Ed: Hey thanks to you definitely great to be here, it’s been a long time been on the podcast. Steve: Thanks Ed, how did you come up with the idea, tell me about Klaviyo, what’s the back story behind it. And I’m actually really curious about the name also how you came up with that. Ed: Yeah, so the quick back story, our background the flunkies background had really been in marketing for kind of the large scale fortune 500 players, so the Wal-Marts and the Targets of the world. And what we saw there was that those companies have a ton of money, were spending tons of money on engineers, on marketers to basically take everything they knew about customers to drive kind of smarter and more personalized just better marketing. And I think we really stopped and said, hey, wait a minute why is this only happening in big companies and also why does it take so much money to not just send everybody the same marketing message. And so from that we kind of started giving a toss in ecommerce, and really said if newsletters have the most marketing as always been, let’s just send the same thing to everybody. If we can pull in the pages, some things like that, the categories they looked at, what they bought, if they just had a support issue kind of where they are, anything we know about those customers. We can send an email that one the customers are going to like a lot better and we can also send an email that just going to be way more effective. Steve: Just curious for these large fortune 500 companies, do they have home grown solutions, or do they use third part solutions as well? Ed: It tends to be a mix and a bit of a hunch pad. I think what has been remarkable through us throughout is that the assumption was kind of that had these giant companies have really solved this and they’ve figured out and they haven’t. And for the most part they are using some off the shelf system, but coupled away with lots of engineers, lots of marketers in a lot of the manual work. And we see the same thing in ecommerce like just because a store has 50 million dollars in revenue, it doesn’t necessarily mean that these are solved problems, it doesn’t necessarily mean that they are any more sophisticated than stores that are much-much smaller. Steve: Interesting yeah, I can tell you I’m by no means anywhere close to having a large store, but I have been up until the point of trying Klaviyo. I had this hunch pad of stuff where I was pulling stuff out of my database, creating a list, and then using my email marketing provider to send targeted emails, it was just really messy. Ed: Yeah, that’s pretty common, I mean it’s — and it takes time, and you don’t want to actually do it. Another frustrating thing is that you end up — you can’t just automate it because like as soon as you are fully tied in into all that data, understood, go for basics, like you can just say hey, flip the switch, make these things automated and then you just know they are always going to be running. Which just one has way more impact and two gives a lot of peace of mind, because it just takes me off here like already overwhelmed plague. Steve: So Ed are you a technical guy at all, or surfer guy or? Ed: Yes, so I have been in past lives and a little bit in early days of Klaviyo, for the most part also these days. But that’s kind of where my DNA comes from, and I founded the business with co — a past coder who kind of very strong on the engineering side. Steve: Okay and for you guys how did you guys start, actually I want to get to the name first, how did you come with the name Klaviyo just because — yeah? Ed: It’s a great question, so at the time we were kicking around a bunch of different names and we wanted something that really evoked kind of trying to help people. And it’s rooted in the Spanish word for — the terms kind of the space ship and the rock faces to help climb and kind of have a big endorsement [ph]. So kind of the idea of what’s hey, can you — what helps people. And then it just stopped, kind of when we started to grow we always thought hey, this is for temporary, but we just never changed it and now have grown fond of it. Steve: Okay, and then in terms of the motivations for you starting your business, were you trying to target the little guys or the big guys, like what was your target market when you first launched? Ed: To start with, we really started focusing on the little guys; we started focusing a lot on shopper stores, [inaudible 00:08:04] stores, big commerce stores, [pollution]. And the thing was hey let’s take what these big guys should be doing or kind of doing and let’s go to the really little guys. And then as we’ve grown we’ve seen that it paid us, just the really little guys people who have, store sales thousands of dollars not hundreds of thousands or millions of dollars, they had the same needs as then the next set the people up, they are going to be able to sell hundreds of thousands or millions. And so we’ve just seen it kind of grow and grow and grow until now we work with a lot people who kind of just starting out, we kind of have a whole sets of plan where klaviyo can be like automatically build a bunch of emails for you, automatically build all these automatic flows and just set them up in your base [inaudible 00:08:52]. Obviously we work with kind of some of the largest and fastest growing ecommerce stores. Steve: Yes, so the thing is with new guys they are probably aren’t even familiar with email marketing in the first place, right? So I would imagine it would be a harder sale for a real small guy as opposed to someone who is larger. Ed: Yeah, so the thing we see with the little guys– I mean at some point you’ve got to — the key things you have to sort of initially is just get the business up and running, figure out where you are going to buy the product from, how you are going to sell it, get the first set of people to do the same. The second piece though kind of as soon as you will be on that stage, I think we see that parts of the email marketing work really well, very specifically automating things like a banner and carts and going back and strapping people above before. Kind of the things that are just going to run in the background they kind of like maximizing the audience you’ve got are really worth it, because you can spend a couple of hours get fully up and running, and then not touch again for months. And then over time you can– as that audience gets bigger start to really think about getting newsletters for lead and trying making sure you are just really capturing as many emails as possible. Those things, once you are beyond kind of the first tens of thousands of revenue, it’s — they are really what can make this business have a predictable steady income, because you then have an audience that you are capturing, and get them — work with. Steve: Absolutely, so in terms of just Klaviyo you started this in 2012 you said right? Steve: So when it comes to starting one of these server [ph] companies, there’s actually quite a bit of competition, how did you actually validate your idea and know that you are going to be able to make money before you actually invested serious dollars into the development? Ed: Yeah, that’s a great question. I think we are big believers in testing and just trying to figure it out. So we basically, it was myself and Andrew my co founder at the time, and what we did was he spent kind of all the everyday examining, like building different little things, testing out like kind of building different ideas. I spent all day every day, emailing and calling everyone I could think of, and saying like hey, this is what I have got, would you buy it? Even though at the time it was either might fully exist, might not exist, might be kind of go together, might be an idea. But just really learning from people and seeing who would buy what. Then it took a while, I mean I probably spent, that phase was definitely kind of three months or so. Steve: Oh, a couple of months okay. Ed: Yeah, so it was a couple of months until — but we kept hitting, a couple of months of just a bunch of ideas, bunch of things that seemed like they might work, but now not. But prior three months in, I had sort of honed on ecommerce and beginning [inaudible 00:11:32] exactly what you are saying. I’m pulling resource to my past customers, I’m putting it in excel, I’m tapping into my email system. And I do that once a month and hey; it makes me a lot of money. And so once we had that twice it was like hey, wait a minute this is, we really think there’s something there, so then it was like hey, let’s find the next eight people and call them. And that phase of we got the customers to start, people who were paying us a little bit and a lot. Started to be kind of validating and then helps us to expand to say hey, people don’t just – it’s not just the special versus it’s just kind of like a widget to email past customers. And I think we then realized hey, wait a minute this needs — it’s kind of got to be newsletters or something else Steve. Steve: So do you guys run an ecommerce store yourself or? Ed: We have some good — some very close friends who do. And so kind of throughout we’ve had some people that we’ve known before this, and known throughout where we can call up and say hey, I just want to understand kind of what you are doing, and like how this might fit. And can we test some things out, what really matters to you and those conversations are super valuable. Steve: I’m just curious, did Klaviyo start out as an ecommerce marketing platform or? Ed: It didn’t, and I think it started — at first we were thinking just broadly about this problem of hey, all this information about customers is just thrown away, and we are all back on these offers, so we really think actually like a software marketing platform. And you kind of start with what you know and the needs just — in some ways it’s simpler, and some ways it’s much bigger than ecommerce, [inaudible] [00:13:05] what ecommerce is like. With any store you can basically say hey, if you are not running these five emails, you should be and they are going to have a good result and your customers are like, if I have to get on time, like it’s just very clean, in a way that some other markets aren’t as much. Steve: Yeah, I mean what attracted me to your service actually was that it was very specifically targeted to ecommerce, like your copy all points to ecommerce which made it much more attractive and much easier to figure out what your services are all about because of that right? Steve: Okay, we will get into those sequences in a little bit. I just want to probe a little bit more about just the start up for Klaviyo also. This is a sales [ph] company, so how much did you invest in the business early on? Ed: Not much, so I mean to the point that not super specific. So because there were two of us, the costs were really keeping like staying alive, like we surviving. And then for the company it was really just running the servers and then kind of other related email costs, but pretty low, and they really go with our customers. So the great thing about science is that we put kind of the revenues could fuel the business. Steve: Okay, and then you guys had quit cold turkey before you started it? Ed: Yeah and I just always wanted to do it, and so said hey we’ll just, we’ll give it a shot, will get– push customers and I think is a minimal and see if we can make this work, and then I can always go back and get a job later. I’m not sure that was wise, but it was the attitude at the time. Steve: No, I mean a lot of people I interview that’s how it goes, so I was just curious in your case. So tell me about some of your first customers, so you have your validation customers, they are probably paying you or not paying you very much, what about your first real customers, how did you get your first real customers? Ed: Yeah, so a choice we made for better or worse is that we were going to—we’re going to make everybody pay, even if it was five bucks a month, just to say if something is really a problem for somebody, they are willing to pay us a little bit. And so those people came all about kind of three months on, and we largely severally met kind of in the [inaudible] [0:15:54] we met by reaching out to people online. So one was custom made sweet company in Boston called Blank Label who kind of was one the first piece we talked to about this idea. Pretty early on we met via the Shopigy blog I think, this guy is [inaudible] [0:16:10] who make really cool kind of like wall designs and come to school [inaudible] [0:16:18] manifesto and custom made cards. And all those I think were great, because we could kind of grow with them and we could– they would give us various ideas and feedback and really push us, and also we could just really see this add value right away. Steve: Okay, and were those early customers enough to just keep the business afloat? Ed: Yeah, I think they were the– at least enough to get the promise of hey there is going to be more coming next month, you’ll see more coming the next month. It took– there was probably about six months to a year where we were in a largely pouring everything back into the business. We were very focused on because we kind of this was our– because we were watching other software companies, the progress was really, hey let’s get this to a point where it’s a real ongoing business, and if that means pouring all of the kind of money back into it, once we had that little bit of traction we knew the end was inside that we– that was going to be possible. Steve: Okay, I’m just curious when you had these first couple of customers, was your service open to the public, or were you just kind of capping it at a couple of people until you were confident that you can roll it out to the masses? Ed: Yeah, we opened it immediately, and it was just being real like hey if something is really a good idea you know you don’t worry about necessarily being copied and hey quite frightening when you are starting out like you just want people to have heard of you. So if anyone did come our way we’d kind of go out of our way and try to make sure we could work with them or figure it out. And that worked and it helped us refine that idea, and we started to see people that we never heard of or had reached out to, or met in person actually showing up on our door and that kind of really helped us validate and kind of stick with the mastering too. Steve: So I’m just curious when you first launched you didn’t have like this built in audience already, like a huge email list or anything like that, right, it was mainly just going out networking and meeting store owners? Ed: Yeah, it was all, yeah exactly, so it was a lot of hustle either, hey here’s where store owners hangout, so I’m going to try to just know people who know store owners, or hey I know a couple of store owners, can they introduce me to their friends, and then also saying hey if I look back at the people I know, whether it’s from schools and like alumni networks or other people I know, and software companies in the latest phases like who might know someone. And if I for every person I talk to there is somebody who refers to, do they know somebody. And so it was just like, hey let’s get on the phone, I mean here [inaudible] [00:18:39] and I’m like hey do you know anybody else who might be good and kind of through that process enough to get like a whole set kind of validating customers came out. Steve: Okay, and by going that route is obviously not scalable, and so how did you start generating larger and larger amounts of customers? Steve: For SEO or for other reasons? Ed: We were trying if for SEO we are also trying to serve. If people with the right audience, if we could just kind of guest blog or use their audience to just get some name recognition too, because given the numbers and to start with we were like we just needed to find the next like 10, 20 people. So we tried doing that, we tried some cold outreach just of like hey we’d see stores without any cool stuff and we were just like dropping in and say hey, are you doing this like we think we can basically be helpful, and yeah it was just kind of trying a bunch of different things. Steve: So out of all those, which tactic kind of worked the best? Ed: Yeah, I think to start the app stores really worked well. Steve: And so yeah I’ve noticed your app in the Shopify store, do people just kind of find that naturally, or do you kind of have to push people towards it too? Ed: No, people tend to find it naturally, something we are doing in Shopify and also have this– we have a free app that we give away that’s– people can easily build a response of email support, and so a lot of people find that free app and then from that say hey I want to use this for all my emails or I’m trying to send this email, can you help me out. So that’s– at first [inaudible] [00:20:56] and for the kind of new just running out stores has been a really great way, they can get started for free and kind of understand what this is like. We also have a free plan on that app, and so they can also start free there and then gives kind of that path upwards. Steve: Okay, yeah it seems like when I was just looking at your integrations it seems like you integrate with almost every cart under the sun, so it sounded like that was one of your main strategies right for proliferation? Ed: Yeah, exactly it was basically hit those– if we stick with one it makes it easy for us to get all the customer data. Number two we can– they’ve got these ecosystems of people who are looking for products that can do this, and so that was just like an easier ways to get to a bunch of customers. Steve: Okay, and so do you have tight relationships with all these shopping cart builders, and have access to kind of their customer base so to speak, or negotiated something on those lines? Ed: Yeah, exactly, so for us there’s been just a great—one they are great partners and fun to work with, but two they’re– this a great distribution channel, because they just have that prebuilt reach. Steve: And there is no resistance, right I mean it’s a win-win on both ends, I would imagine right? Ed: Yeah, right exactly, like at the end of the day it should make their platform stickier and they just — the happier their customers are the more their stores are growing, the better off they are and like our core goal is just to like get stores grow. Steve: Okay, everything is in line. So you got these customers now, what are some tactics that you have to just keep them around, like how do you reduce churn? Ed: Yeah, so the great thing about email, the two great things about email, one is if you– a lot of it can be automated, and once this is automated it’s– there is no effort required, it’s literally just a money machine. And so if we can get people up and running and make them really successful, it’s great on both sides, because there are basically delivered a certain number of dollars every month, and our goals is to try to way less than that, and it’s good, everything is good. The second is that because it is about growth kind of if we can help people grow the newsletter list and kind of expand and just like grow the business overall, in addition to the automated emails, but also by targeting the marketing by newsletters, by bettering emails, that just is stickier as well, and it’s kind of like once you have that engine running, you as a store it’s not really worth moving to a platform where you are going to have to then hire an engineer and make them do more work for you, hire more workers, like we can replace a lot of that, so that’s worked well for us. Steve: I guess in your case it’s a little different, because you have access to the sales data also, and you can literally tell your customer this is how much we’ve made for you this month, right? Ed: Yeah, so it– and it keeps [inaudible] [0:23:37] too and it’s like a the—it’s very [inaudible] [0:23:41] if we were not doing a good job, and somebody was not making more money like they would just know right away. And so it really holds us accountable to if we can deliver value, you are going to stick around, if we don’t you are not. Steve: I guess the hardest part in your case then is getting the customer to actually do the integration and then install it and set everything up, right? Ed: Right, so the goal and this– it’s a challenge that we are continuing to solve and we’ve solved for some platforms, how much work can we do for the customer? And so for some platforms like Shopify literally if you just enter your store name and click go, tell us what your logo is, tell us who your customer is, we can set up all these emails, build like 10 different email templates for you, we can kind of get this all the way, and so that’s great. And so that makes it much easier to people over the line, if you are not a custom platform or for some of the other platforms where their APIs are—or how they work is a little bit different, we do less of that to start, but our goal is we’re going to constantly try to figure out ways to just to kind of shorten that time to value as much as we can. Steve: Incidentally I was in that camp, right I heard a cart that you guys didn’t support, and I had to hand you everything, but I got on the phone, you guys I think I always kept talking to the same guys I felt bad. Ed: Good, that’s why we have that team too, so there are kind of like just how to hack the game. Steve: So it seems like your platform is naturally averse to churn once you get things right, and the way you get people to get on the platform is you have these one click integrations with all the popular shopping carts, so okay, so I can see that. So there is a lot of other platforms that use similar things to Klaviyo. And so I’m just curious from a marketing perspective, what are some of the things that you point out that set you apart from some of these other competing services, and do you ever find yourself going head-on with some of these other platforms? Ed: Yeah, so the way we see the email market generally is really broken into two buckets. I think there is one which is just people who are afraid of newsletter centers, that’s also where we see most people right now. It’s like, hey I’m seeing the same more than everybody, maybe it’s kind of I’m plug-in in some of my store data, but not really I’m definitely not setting again a course through that, or probably not like say when you keep on like what they have and they haven’t bought. And really for against those platforms, it’s really just explaining the integrations and the data we bring in and what we do, and the time it takes to set up. And that’s the key thing there, and there is both kind of allowing people like that and there is also then you know the people have been around like the high end ecommerce platforms have been around for ten years they are really expensive, but just don’t– they aren’t that much better to be honest than those these other centers, so that’s one. Then there is a separate bucket of a bunch of people who are kind of just trying kind of doing the same types of things we are trying to, and what we largely see is so far the– we’ll see the people like coming off like little pieces like they are really nil [ph] and that kind of thing. They are really nil like the win backs and the follow ups, start to try to like cover up these newsletters, but we just haven’t seen kind of anyone who is like a very effectively sort everything, and that it’s [inaudible] [0:27:05] since we can’t hear there is like big missing holes in the features ads. Steve: I can tell you from my personal experience, I actually wrote my own abandoned shopping cart thing for my cart, yet what ended up happening was like I could use it just by—it was pretty hands off, but then my wife didn’t understand it. I didn’t make it user friendly, so my wife couldn’t do anything about it, and so when I moved over to Klaviyo like okay, wife you can handle everything now, which is really nice. It made it really easy for some– my wife is not a technical, so it made it really easy for her to manage. And so let’s switch gears a little bit, and talk about some of these automated flows that you have in place. Ed: Yeah, so the way we think about ecommercing or marketing, we actually think this is, it’s true beyond ecommerce, we have a bunch of customers who are not ecommerce kind of a separate topic, but if you think about like the first time somebody shows up in your store, there is a period before they buy, and there is a period after they buy when you are trying to get them to come back. And the goal is to really say you kind of put yourself in the customer shoes. What are the messages that you might want to get, and what are the messages that really are going to speak to you at those different times in your life as a customer? And so before you buy it’s– the automation is hey the first time you see somebody tell them the important things about the brand or the store. And so if you are selling something that’s like highly branded or you have a pretty diverse set of products, it’s introducing them to the unique products you have. If it’s– there is something unique about you, if it’s hey here is the back story or here is who is creating these products, or here is some cool uses for these products, or here is our great occasions for these products, it’s really kind of providing that context around yourself or to somebody who’s proactively said, hey I’m interested and I like what you are doing. So that’s a whole set that we typically call like a welcome series, but it’s really just to think about your introduction to somebody. Steve: Son this is before they either make a purchase? Ed: Right, this is kind of from the moment somebody gives you their email address for the first time, so then later on your site kind of you invested to get them to your site, and when on your site then say, hey yes I want to learn more about this, I’ll give you my email address. And then we really think about and just hey what– if you had five minutes with somebody, or if you had a minute kind of four times a week like what would you want to say to them about your store so that they really knew when this was going to be a good fit. Because a lot of buyers are going to show up and either they are not going to have the knee jet or they are going to have other things going on or if it’s occasion based thing they are not going to be ready for that. They are not at a point where they are going to buy, so they just need to know more. And kind of rather than just hitting them with your typical newsletter, it’s just a good time to like make that a more personal introduction to what you are doing. Steve: How long have you seen the sequence to be like for most stores? Steve: Do you have an example? So you mentioned the first one. You explained kind of what your company is all about. What do the second and third look like? Ed: Yeah. There’s kind of a few a different types. The first is often just depending on where you are at and kind of how smaller you are, it tends to be just—and so much it’s just a personal welcome and kind of like explaining maybe the context of the store, or any of kind of the important back-story. It’s really just like a branding email of, “Here’s what this is about.” And a lot of that is also just a reminder to say, “Hey, we know you are interested. Here’s an easy way to get back.” Put a big button to go back to the store. And kind of just make that good first impression. The second is often times around products especially if you have—I’m just selling… what are the things you typically see people buy first, or what are the products you think really will put your best foot forward is often a good second introduction. Getting into the third and fourth is really, we see as either going further on products or branding. But also depending on your customer likes, like depending on when you think people buy for the first time, will often see like the last email on that series which could be two weeks in, it could be three or four weeks in or even ten weeks in. Steve: What’s an example of a non-financial offer to get someone to the site? Ed: Yeah so we’ll see— the best way we tend to think about it is kind of seeing why hasn’t somebody bought? And this is going to vary by business. And so one is there’s something about your product that they don’t understand. There’s something about what you are doing, where they have like a reservation like this is going to be hard to set up, or it’s going to be hard to do something. Steve: Hey everyone, I just wanted to take a quick moment to thank Famebit.com for being a sponsor of the show. Now FameBit is the number one market place for You Tube influencer for marketing with over 15,000 You Tubers looking to promote brands from beauty, tech, gaming, pets and more. Now videos start as low as $50 and it’s completely free to post a campaign and receive proposals from You Tubers. If you’ve listened to my podcast before, one of my guests, Emmanuel Eli, used Famebit.com to make over $65,000 in four months with You Tube influencer marketing. And the best part is if you use coupon code ‘my wife quit’ at famebit.com, you will automatically get $10 off. So go to famebit.com right now, and get famous You Tubers to promote your products. Now back to the show. Steve: I’m just curious, do a lot of people use the customer behavior aspect for these emails. Like for me for example I instrumented it in such a way that I could see exactly which categories or products that a customer was looking at. Do a lot of people use that information in these first introductory emails, or is that information primarily useful later for different sequences. Ed: Yeah it’s a good question. So the most important thing especially depending on what you are—if you are going to do some sort of offer as often turning those off if somebody buys, so in so much as using that customer’s photo to say “This person has not bought. They are on a different phase.” I turn those off. The second piece is we do see some of the people use that conversation around, hey here’s the products you are looking at, the categories you are looking at and starting to really to customize. It really depends how important that is to your store, if you’re apparel and you sell men’s and women’s it’s more important. If you have two very different products or you are a store that sells music and then they sell apparel, and like the buyers are very different. So then it’s important. But if that’s not the case, then usually it’s maybe important down the line, but at scale when you are smaller it’s not a big deal. Steve: All right so we cover the pre-purchase sequence, what are some of the other sequences that you have in place. Ed: So kind of pre-purchase, the next real big sequence is around abandonment. I think that tends to be both like pure shopping cart abandonment, as well as more often set up kind of site visiting abandonment basically because Klaviyo has built in web tracking. We know when somebody has clicked their email, or they have entered through another site we then know who they are. And so if somebody is visiting the site repeatedly and not buying, we’ll often see flows that have to go target those customers. And kind of it’s the same type of offer of either help or questions, or even after a certain time like a financial offer. Ed: Yeah. I don’t know what’s going on outside today. Steve: I know it’s a second one. Hold on. They just marked down the time here. So I know when to cut this. Let’s see 33 minutes, okay. It’s gone. Yeah, so Ed, I actually was pleasantly surprised when I went to the abandonment sequence in Klaviyo. I clicked on flows and clicked one button, and you guys already had a sample thing already set up and all I had to do is customize it, which was very nice. Ed: Good. Yeah that’s definitely the goal, just to pull the pictures of the product and just be ready to go. Steve: Yeah and so in terms of the abandoned cart, would you say that as a new user, would that be one of the biggest low hanging fruit in order to get a return on your email investment? Ed: Yes. I think if we’d point to the absolute mass set ups, I think abandoned carts would be right at the top of the list [inaudible] [0:37:25] a second. But the meetings you invest so much in getting somebody to your store, that abandoned carts is just really important way to—everybody is busy, everybody’s like going on. Often times when you find something cool you are not going to buy it right away, so they are just an important way to make sure you capture as many people as you can. Steve: Okay. And then in terms of the number of emails for these sequences what are you seeing that most people are doing that works well? We do see that segmenting that email which is kind of super easy to do based on people who’ve bought before and haven’t bought before, kind of opens the door to say, if somebody started to buy, didn’t buy, hasn’t bought five days later, they are worth including in like reaching out, reshaping or just kind of something like that, those things definitely work. It really depends on what stage they are at, what the margin of the business is, how promotional you want to be, but also then making sure those are turned off for repeat buyers. Steve: Interesting. So for people who abandon and they’ve already purchased in the past you do not give a coupon? Steve: All right. And just curious from my knowledge, what conversation rates do you typically see from these abandoning sequences? Ed: Yeah so it really depends on product. And so we see anywhere from you know, we’ve got some businesses that have crazy conversion rates of like 30%, 40%, 50%. Ed: And that is not what I would expect. So it really depends on how much thought someone has to—how much thought they put into the purchase, and the reasons they don’t buy. The core goal of abandoned cart, so one is a reminder and then two is overcome any like even reasons in the customers that they don’t want to buy. And for some reasons that might be “Hey is there a cheaper price somewhere else?” You just tell them how unique your products are. For others, it might be, “Hey is this really going to be as good as they say,” and that kind of be like an address for like a customer testimonial or something like that. For others it might be just like is shipping going to be super costly or how long is it going to take to arrive or things like that, you can kind address those too. And so really the more of those you have to knock down, like the more it’s just a reminder, you’ll have a lower conversion rate, but we typically see two to ten or even kind of a higher percentage. But the more kind of objections you can knock down, the better off, the better those do, but it is product specific. Steve: Okay, I was just curious, but I think my second email has not been converting well. The first email converts great. I think I’m getting like tenish percent, but in the second one is, which is expected I would guess. Steve: It’s like a big drop off. Ed: But it does totally—it really depends how much people—we have customers who are the reverse. Or it’s like if this is up high intention product, then that second email tends to be really the kicker that works best. Steve: And the next one that you were going to talk about was the win-back campaign? Ed: Yes so this is, I think, if we did this too will be, you’ve got to run [inaudible] [0:41:01] and you’ve got to run win-backs. And then basically is people who have bought in the past are kind of your already big funs. You’ve spent a lot to get them the first time. You’ve sent your product, hopefully they love it, like you—this should be somebody who’s very proactively fond of you. And so the win-back, the idea is just saying, hey if that person that we’ve already won over who’s already a fan, either hasn’t bought the next product that you might expect, or has come back if it’s product so he can purchase twice, follow up and just kind of remind him that you are there. And make a choice whether that’s going to be promotional or not. And it’s really a choice around like, your margins and how much value you think that might bring. But it’s just like capture the audience that likes to hear from you. And so typically you can run those as campaigns, you create a segmented list and say, hey find everybody who purchased six months ago and hasn’t bought again. Or kind over time you can just automate that to say, hey average 20 buyers at three months, six months, nine months, here the emails are going to get. The first one is just going to highlight product they might like, the second one is going to get them free shipping, the third one is going to be like a more personal outreach that asks them to tell their friends about the business. And then just like have those running. And so basically every customer that comes through and buys first time, you know you are going to be nurturing them over the next year to get them to come back. Steve: Yeah. And this is like really key for people who sell consumable products, right? Ed: Yeah, so it’s key for consumables, but really anything that someone could buy twice. And so it’s key for apparel and anything where it’s not like a once-every-three-years type of thing. Steve: And do you find that it’s helpful to provide product suggestions in these win-backs because you know exactly what they purchased and what they are interested in, right? Ed: Yeah. So as much as you can exactly, and this is where I like that customer data of, here’s what you’ve looked at, here’s what you bought, all that stuff can be super useful. And sometimes might, depending on your business can change with that flow, like we’ll see people say– say you are selling something like iPhones and you also sell headphones where the natural time for somebody to buy is right after [inaudible] [0:43:28] so we’ll see them have that win-back go out really be more of a cross email that goes out like two or three weeks after somebody buys. Steve: That’s cool and that’s completely automated for these customers, right? Steve: Are there any other flows that you can think of that are pretty easy to set up and worth doing? Ed: Yeah. So the others we see that are valuable I think, maybe not as valuable like the win-backs, but of course which is good with structures, one is product reviews. I mean it’s pretty straight forward, but worth following up on a purchase. Any sorts of cross-sale type emails specific to your business of if somebody buys X we think they like Y, setting those up. We’ve—as you are scaling it a bit larger, flows around “Hey I’ve been emailing you, you either stopped engaging, you stopped opening, you stopped clicking. You just seem less intriguing to stop visiting the site. We see people setting up flows around those to then basically automatically clean the list over time to say, “Hey I just want to let you know we are going to follow up and take off the email list. Let us know—click this link if you want to stay on.” So those can be good too. Those are part of the main ones. I think the key thing is like just for every business, think about– put yourself on the customer shoes, think about the emails you would like to get, and whenever possible automate it, because you still don’t have time to handle all those manually. Steve: Just curious, I was wondering if you can comment on some things that you can do to kind of improve deliverability, open rates, click through rate, and that sort of thing. Ed: Yeah, so deliverability really shouldn’t be a problem. If it’s a problem it’s either something with your email sender and it’s not a promise you went in to, and so follow up with them, switch ISPs, social email senders. The second piece is, I mean it can happen based on how many emails you are sending and what they look like, there’s some other legitimate reasons it can happen. I think the main thing there is as long as you are putting kind of yourself in the customer shoes and sending emails of what you think the customer would like, you should be good. That’s kind of on the liberal side. In terms of open rates and click through rates, so we tend to kind of break that into two problems. The open side is pretty much all that can go on is, the subject line and like the experiences with your past emails. And the main thing there I think we’d say especially if you are starting out is—I mean we kind of always go back to this think-like-the-customer and that definitely works. It tends to happen when either when you are either sending too many emails, and so the customers are not getting a ton of value from each one. Or you kind of send a series that no one was clicking and no one was reacting to. And the main thing is put a little bit of attention into the email the first time. And think about if you got it the same thing you would want to click or you will want to react to and if not then either, “Hey could you send less” and that actually gets to that point which strangely converses you that the other problem is not just sending too few. Like if you are emailing people once every two months they typically will forget, like they are not going to remember and like also your opens and clicks go down. Steve: Is that kind of automated in Klaviyo? I haven’t got to that point yet. Ed: Yeah it’s super easy. And basically for every email, you click a button and then it gives you two versions of the email, and you can click one and change the subject, click the other one and change like take out a different picture. And then when you click go, one is going to be by default. It’s going to say, “Hey take the first chunk of my list and split those emails up and send them up to those different chunks, see which one does better.” And then for the rest of the list it’s going to send out the winner to everybody else. And so it’s kind of a low cost wage. So start to learn but also like, rather than ever stressing on “Hey are people going to like this. They are not going to like it.” If you do that you just kind of have— it’s just low risk, because it’s going to always push the winner out. Steve: And I was just curious what your take on single versus double opt-in was. I know in the blogging world it’s pretty controversial, but it seems like in the ecommerce land, no store that I shop in out, has asked me to double opt in for something. Ed: I think we are big believers in—I think we tend to fall on the single opt-in side for ecommerce. And the key thing is—it’s got two key parts there. One is, just be super clear about when someone’s signing up. Why they are singing up, I think in eCommerce we tend to see it that people who are signing up because they know what the—you’re going to send them to. The second thing there was be super clear on how somebody gets off emails and unsubscribes, and can choose to get either fewer emails or no emails from you. And once you are doing that I think it matters less. I think we just see that double opt-in just confuses a lot of people. Like they have already said they want in, so they don’t expect to be asked again. Steve: So I was just curious is there a time in place for double opt-in in ecommerce? Ed: You know the problem—it’s a good question and that one is important. There probably is like if for some reason you think, based on how your email capture flow or kind of like, if you think there’s any ambiguity to the person signing up about, whether like they are actually signing up on email list then double opt-in is probably a good fit. But as long as it’s very clear to the customer, then I think there’s at this point less info. Steve: Yeah I know it’s interesting that you said that because I had my other favorite email provider on the podcast and he was like strong double opt-in. It was quite the contrast between what you said, but it was two different industries of course too. One was like kind of online marketing so to speak and this one is just purely ecommerce. Ed: Right. And I think that’s like a big difference. Steve: Hey, Ed I know I’ve kept you on for quite a while. It was a pleasure having you on. If anyone wants to check out Klaviyo, or if they have any questions for you and your team where can they find you? Steve: And it’s K-L-A-V-I-Y-O, right? Ed: That’s right. Got to keep it, keep you on the toes. Steve: And Ed I’m doing your job here for you, but you guys offer a free tier right? Ed: That’s right. So as a source of getting going, yeah it’s absolutely for you to start and own it till you can—you know the same stuff around, plug in your store, it takes minutes, we’ll set up a whole bunch of template for you, and also a bunch of these emails just come in like pretty build out of the box. So you should be able to get depending on your platform, you get a lot of these going just in minutes. Steve: By the way just for the listeners I’m not affiliated with Klaviyo in any way, it’s just I really like the service. And there’s actually—if you are just a brand new shop owner you don’t have that many customers yet, you can actually, I can’t remember how many people you can track for free, but it’s something like 50 or a 100 or something like that. Ed: Yeah so we actually let you until you have your first 100 customers, it’s just totally free. So it’s a great way to just like get started and see. And even you will see kind of the value, and you also see your customers get some cool tools and they are around like. Seeing the customer who they are and their full history of what they looked at and done and kind of a fun and just like a cool tool to just help manage the store. So yeah with all that, it’s kind of great, we [inaudible] [0:52:27] come through. Our new stores come through on every plan because I know they are kind of the most exciting, they are very exciting businesses because they are out there out of par. Steve: I mean if anything, go and sign up and just implement the abandoned cart plan tool. Cool Ed, it was a pleasure having you on the show. Thanks a lot for coming by. Ed: Thanks Steve. I appreciate it. Steve: Hope you enjoyed that episode. Now Klaviyo is actually not a sponsor of the show, but I’ve been using their email service now for many months and I love it. Running an ecommerce store is so much more complicated than running a blog, and you can tell that many of the features of Klaviyo had ecommerce specifically in mind and I think it’s fantastic. For more information about this episode, go to mywifequitherjob.com/episode82, and if you enjoyed this episode please go to iTunes and leave me a review. It is by far the best way to support the show and please tell your friends because the greatest compliment that you can give me is to write a referral to someone else either in person or to share it on the web. Now I’m also offering free ecommerce workshops on a regular basis if you want to learn, for more information go to mywifequitherjob.com/workshop. If you’re interested in starting your own online business be sure to sign up of my free 6-Day Mini course where I show you how my wife and I managed to make over 100k in profit in our first year of business. Go to mywifequitherjob.com for more information, and sign up right on the front page. Once again I also want to thank Bigcommerce for sponsoring this episode. Bigcommerce is one of the best shopping carts that I recommend if you want to start your own online store without having to worry about anything technical. Everything from design, to sourcing, to payment processing, is all built in, so all you got to do is populate it with the products you want to sell, and you can literally start your storey in a matter of hours. Simply go to Bigcommerce.com/mywifequitherjob, sign up and you’ll instantly receive one month free. Once again the URL is Bigcommerce.com/mywifequitherjob. I also want to thank HostGator for sponsoring this episode. HostGator is one of the best webhosts out there that I recommend if you want to start a blog. In fact I hosted Mywifequitherjob.com on there in the very beginning and loved it. You get 24/7 live support via chat, phone, and email. You can install WordPress in just a single click, and they have an easy to use website builder and design services. And the best part is that I’m offering a 30% discount for all podcast listeners. Please go HostGator.com/Mywifequit to redeem the discount. Once again that’s HostGator.com/Mywifequit. Thanks for listening. Be careful with Klaviyo. When I did not want to use Klaviyo anymore, I let my credit card expire. Klaviyo then automatically updated my credit card expiration date and kept charging me without letting me know. I’m fighting to get a refund on those charges.